In this guide, I will cover the different ways you can cross train on land to improve your surfing. There are few different types of skills you can choose to develop on land, but each one will require different tools, so the first choice you should make is to decide what skill you want to improve. Maneuvers such as cutbacks, bottom turns, pumping for speed, etc. The Pop-up and the drop. If you are new to surfing you would probably learn faster and have more fun by starting out with a longboard and mastering some basic surfing skills such as paddling, popping up, riding across the face of the wave and developing an eye for picking the critical part of the wave before your move on to a short board. With that being said it is not impossible to start with a short board. If you have the time, live close to the beach, and can surf almost daily and use cross training your odds of picking it up will increase. The goofboard is marketed more to long borders because it allows you practice moves like cross stepping and nose riding. Parallel roller balance boards are very simple and cheap to build yourself. Learn how to build a balance board similar to the goofboard here. The down side of the goofboard. Parallel roller balance trainers like the goofboard lack the ability to let you practice moves like cutbacks or bottom turns because you cannot spin the board on the roller. Goofboards have a bit of a learning curve, so you have to be ok with knowing you will take a fall every once and awhile. They are a bit safer than tradition balance board deck does not sit as high off of the ground like traditional balance boards like the indo board. For more information on goofboards check out my guide to goofboards. Vew-do boards such as the surf 33 are unique because they allow you to practice moves that require you to rotate the board. Vew-do boards are great as surfing cross trainers because the majority of surfing maneuvers are base on turning the board to get to different positions on the wave. Additional the track and groove system can simulate the feel of craving a surfboard by allowing you to ride that board on the edge of the roller. Vew-do boards are an advanced level balance board and do have a steeper learning curve than most other types of surf trainers on the market, so you have to be ok with knowing you will end up taking a fall. Another great thing about vew-do boards is that they also sell rollers for their decks that will allow you to make it easier or more challenging to use. Carver boards are one of best-reviewed surf skate boards available. They create the feeling of surfing on the street by having a specially designed front truck that pivots while the back truck is a tradition skateboard truck. Carver boards are one of best-reviewed surf skate boards available. They create the feeling of surfing on the street by having a specially designed front truck that pivots while the back truck is a tradition skateboard truck. Some of the skills you can work on with carver boards are how to commit into turns fully, how to use compression to generate more powerful turns and improve your pumping for speed. Carver boards will also help with developing the proper timing and balance recovery for moves like pumping, cut backs and bottom turns. Carver boards are great because they combine balance training, sequence training and will build strength in your core and legs all at the same time. How to choose the right carver board. You will get the most out of a carver board as a surfing cross trainer if you choose a board length that allows you use the same width stance you use while surfing. Some of the draw backs to carver boards. If you already know how to skateboard it will still take some time getting used to how to use the board properly because of the unique trucks. The carver board is one of the most dangerous surfing cross trainers due to the likely hood of you taking a hard fall on pavement, but at the same time probably one of best products you can use that will improve your performance in surfing. Taking a hard fall while using the carver board could cause an injury that could put out of surfing or your job for a while. So you have to weigh the risks of using this product for yourself. Some of the dangers of using a carver board can be minimized by wearing proper safety gear and only using it on a flat paved surface. A lot of the videos carverboard puts out show advanced users that have made riding a carver board a separate sport of its own. These users are doing very impressing things such as riding down hills, skate park bowls or weaving in and out of city traffic while all these skills are impressive you do not need to learn them to use the board as a surf trainer. I think one of these board would be perfect to keep in the back trunk of your car so whenever you have to run some errands, you can take a 10-minute break and have some fun in the surf cross training. A lot of local surf shops in the U.S. carry these boards and most likely will have some demo models they will let your try out. You can also order them thought their website here. Modern day pro surfers cross train just like professionals from other sports. Some of the different types of cross training they are doing are strength and conditioning, swimming, prehab/rehab, cardio, balance training, sequence training, mobility and agility training and body awareness training. One way surfers are improving their performance in aerials is by practicing maneuvers on a trampoline with a foam board strapped to their feet that act as a mock surfboard. Getting better at aerials can be extremely challenging because in a 2-hour surf session you may on spend a few seconds in the air. Training aerials on a trampoline with a fake board is effective because it allows you spend a lot of time in the air learning how to properly move your body to achieve different types of tricks. Training like this is a combination of sequence training and body awareness training. Additionally training on a trampoline will make it much easier for a coach to observe you and instruct you how to improve your technique. 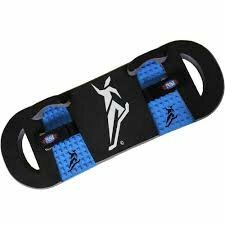 The board is made of foam with a slip resistant fabric on the bottom and adjustable foot straps on top. What I like about this product is that a lot of commercial gyms are offering group classes using this product. So if you can not get to the beach due to a busy schedule or inclement weather you can attend some of their classes to help keep you in surf shape. 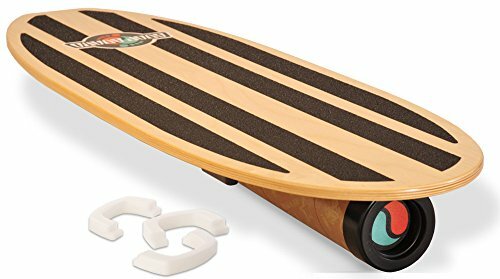 The downside to this product is that it will not challenge your balance as much as other surf trainers as the goofboard, vew-do boards or carver boards will. Due the high cost and amount of space, it takes up I don't think this product would be practical for many people to own. For the price, you could get a goofboard, carver board, and vew-do board and you would have a better set of tools for surfing cross training. This product is one of the safest surf trainers because it is much less challenging to use than vew-do boards, goof boards or carver boards. It can be possible to develop bad habits using surf trainers that may carry over to surfing so always keep in mind to practice using proper surfing form. Below is a playlist of all the coaching videos they have out, I recommend you watch all 9 of them. Below is a playlist of 45 free surfing lessons from the youtube user named "surf coaches". They also offer in person coaching in Costa Rica and have members only coaching forum on their site. If you do any type of surf cross training that you think has improved your short boarding performance, i would love to hear from you in the comment section below. I will continue to update this guide as I find out new methods and products that can help improve your performance short boarding so check back every once in awhile. If you enjoyed this guide, please help support this site by sharing this page with your friends, social media, or relevant website.